Car rental companies often need to move their cars from one rental location to another, a process that’s known as car relocation. Europcar at Lisbon Airport, for example, might need to relocate one of their cars from the Lisbon Airport branch to the Faro or Porto Airport branch. Occasionally, they might even need the car moved to a branch in another country. 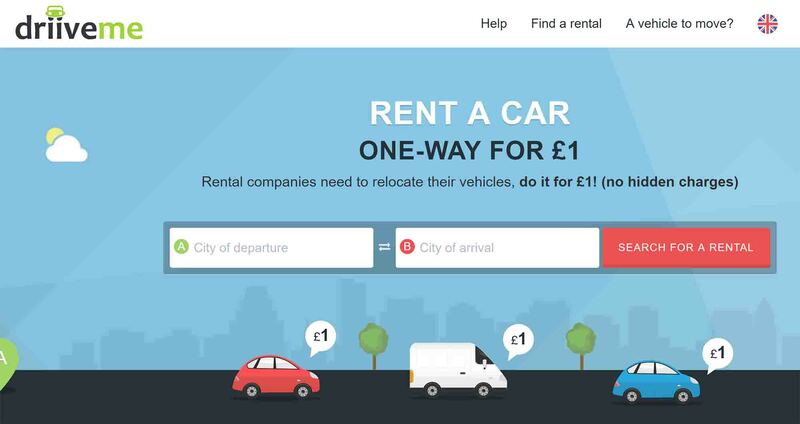 Rather than pay someone to do it, as car rental companies normally do, DriiveMe connects car rental companies with people who would be happy to drive that route and relocate the car – assuming it only costs €1 to rent the car. Available in several European countries (including France, Spain, Germany, the UK, and Italy), DriiveMe could be the cheapest way to rent a car in Europe. Simply head over to DriiveMe and choose the route that you want to take e.g. Lisbon to Porto (note: you have to write ‘Lisboa’ rather than Lisbon). You can also just put Lisbon and no destination, if you want to see all the upcoming opportunities from Lisbon. You can even setup an e-mail alert for when new opportunities are posted. There are pros and cons to DriiveMe. Obviously, the main pro is that you get to rent a car for just €1. There are some limitations, however. The rental period is short: you normally have just 24 hours to get the car from A to B.
There’s a mileage limit which means you can’t deviate too much from the recommended route. There are also costs involved like fuel, tolls, and accommodation (if you stay overnight). From a money-saving point of view, it’s usually cheaper to take the train or bus in Portugal than to drive. The exception would be if you’re travelling in a group, in which case it might be cheaper to drive than take the train or bus. Of course, a train or a bus won’t stop off at all the places that you want to see along the way. That’s something you can only do when you rent a car, and that’s where DriiveMe is most useful. It’s particularly useful if you were already planning on taking an A to B trip e.g. Lisbon to Faro. Car rental companies normally charge a fee for dropping the car off at a different location (normally around €100), so DriiveMe could save you €99 or so as well as the cost of a day’s car rental (normally around €20). You could reduce your costs even further by listing your journey on a ride-sharing site like BlaBlaCar.com to see if anyone want to pay to join you. Get enough people and you might not only break even, but even make money from this trip. There aren’t a huge number of other car relocation sites in Europe; it seems to be more popular in the USA and Australia. Imoova – Mainly RVs and motorhomes that need moving. Occasionally has opportunities in Europe, and sometimes in Portugal.